The PTS 12000 SUPER- SEMI-AUTOMATIC HEAT PRESS has been developed with a stronger pressing system, allowing it to perplaten other kinds of printing than just sublimation, such as: lithographic, puff, strass, hot stamp, foil, and others. 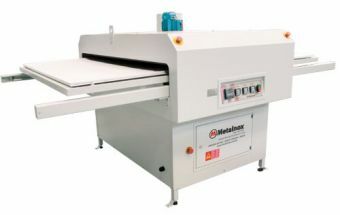 The equipment is fitted with two trays, and has a useful area: 1000x1470mm. While one piece is being pressed, the operator can prepare the next one, thus yielding a higher production speed. The exclusive MSTC (Multi-Spot Temperature Control) is responsible for granting maximum quality to your prints. Fitted with 3 power-supply spots, it perplatens an even distribution of the heat to the entire useful area of the thermal platen without wasting the process power, maintaining color consistency and low costs. The built-in suction system is a pioneer option designed to prevent the transfer paper from becoming stained or from causing shadows on the fabric upon removal of the paper from the press.